Compare prices on car hire in Madrid from all the major brands and find the best deals. When you book through us, unlimited mileage and insurance are always included in the price given. Madrid is the capital of Spain and has 3.2 million inhabitants (2007).Thus, it is one of the largest cities in Europe. 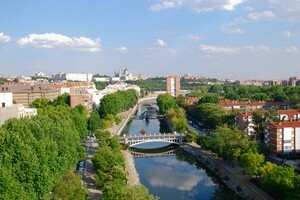 Madrid is situated inland, and has hot, dry summers and cool winters. The center of Madrid is the bustling square in the marketplace, “Puerto del Sol.” (Solporten). This was originally a gate in the wall that surrounded Madrid in the 1400s. Later the site was a marketplace. From “Puerto del Sol” is the nine streets, including Calle de Alcalá is the longest street in Madrid with the famous triumphal arch and the Cibeles fountain. Other sights in the capital’s Retiro park – one of Madrid’s largest and most beautiful parks, the Museo del Prado – a famous Art Museum and Palacio Real – the Royal Castle. A visit to the bullfighting arena, Las Ventas is also worth a visit. Here there is room for 25,000 spectators! The season for bullfighting lasts from March to October. Otherwise, Madrid offers great shopping opportunities, especially in the street of Gran Via. The city also has a vibrant nightlife with many nightclubs, pubs and restaurants.